Update: The Dom Post is carrying a story today saying “McDonald’s restaurants will receive up to $16,000 a year of taxpayers’ money every time it recruits a beneficiary under a partnership with Work and Income.That’s potentially a $112 million bill for the tax payer. New Zealand already has the world’s greatest number of McDonalds restaurants per $GDP and the second highest number per capita (the first is the United States) add to that New Zealand’s dismal record in obseity – third highest in the OECD – and many will ask does the country really need more fast food joints. One time truck stop waitress Social Development and Employment Minister Paula Bennett is citing the relationship with the fast-food giant as an example of the Government’s commitment to getting beneficiaries into jobs but a long-term unemployed person could gain an employer a $16,000 subsidy over 12 months more than $300 a week. Seems like an awful amount of money to be spending at a time when cut backs are being made in higher education courses. “If I have the great honour of becoming Prime Minister of this country then I want to leave a legacy too. Back in May the Department of Work and Income struck up a deal with global fast food giant McDonalds to provide 6,000 new jobs in New Zealand over the next three years. Any ideas other than McDonald’s? I think her question must’ve gone unanswered. Is this the best they could come up with and is a job with McDonalds a career for life which will give all Kiwis higher wages? Is this THE initiative that will give “young New Zealanders a country that they’ll want to stay and work in” or just a cynical attempt to hack a few digits off the unemployment figures? 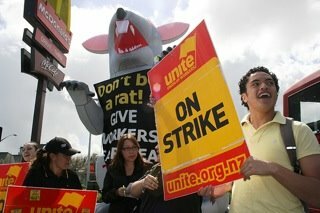 Last year Chantelle Coup, age 18 and who now lives in Australia, was awarded $15,000 after being constructively dismissed from the McDonalds in Kaiapoi for joining the union ‘Unite’ in August 2007. Chantelle, who was 17 at the time, had her hours cut and she was bullied into resigning. Chantelle later said that she’d like to use the money to pay off her student debts. At the time Unite’s national director Mike Treen said in a statement that his union often had problems with McDonald’s franchise operators, saying that they often took the decision of their employees to join the union as a personal affront. The employer was also found to have been destructive in their dealings with Unite Union and to have used undue influence to get their employees to resign from the union. The workers there were all young and none of them had guaranteed days or hours of work. This fact, coupled with pressure from the manager was found to have pushed a number of staff to resign from the union. Unite also stepped up its campaign to end bullying at McDonalds restaurants and supported staff at four sites to stop work to protest a contract that allowed their employer to use their shift roster as a form of bullying and control. They cited cases where a McDonald’s manager demanded that a seventeen-year-old girl stay and finish her shift after her foot was run over whilst working at a drive through and many occasions where workers were pressured to work two or three eight hour shifts in a row with no breaks or being rostered off. Patrick Cornish said he would appeal the decision and file a new case with the Employment Court. Chantelle would have to return from Australia where she now lives to attend the hearing. Mr Cornish did have a range of other options open to him including making an out of court settlement. No such case seems to have been heard at the Employment Court. but neither has there been any news about Chantelle receiving her compensation. “It’s disgusting the world largest fast food corporation is gloating over its soaring profits while the majority of its crew are stuck on minimum wage and managers are paid less than $15 an hour. It is however a true reflection of the world economy with the rich getting richer and making sure the poor stay poor. 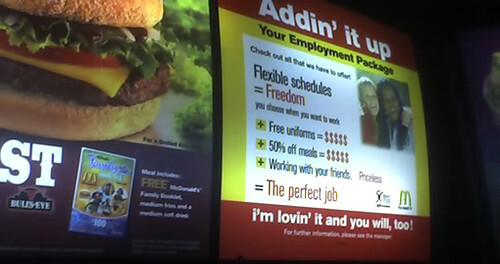 Wage rates for 16 and 17 year olds are 80% of the adult rate, i.e.$10 an hour but that rate is supposed to have been abolished at all the employers organized by Unite including McDonalds, KFC, Pizza Hut, Burger King, and the major movie theatre chains. Is McDonalds really the best company to be pouring the future of New Zealand’s youth into and will it do anything to address New Zealand’s much lamented low wage economy or its expanding waist line.